Raja Petra Kamarudin, ex-biker with a legal background and genetic links to the Selangor royal household, was galvanized into taking political activism online in 1998 after Anwar Ibrahim's arrest and incarceration under the obnoxious Internal Security Act. He was webmaster of the first Reformasi website and was among the group of Anwar loyalists who founded Parti KeADILan with Wan Azizah as president. He subsequently went independent in 2004 and began a news portal called Malaysia Today. It has since become one of the most visited sites for political news and gossip - attracting more than a million hits on certain days. Raja Petra (affectionately known as RPK) has attained "national hero" status with his fearless disclosures of shenanigans that were effectively covered up before the Digital Era precipitated an Information Revolution via independent news portals like Malaysiakini - and socio-political blogs proliferated like mushrooms after a lightning storm. RPK now faces a multitude of charges against him, but he remains unstoppable and untoppable as the nation's most powerful source of earth-shaking political scoops. Although some say RPK is merely a good storyteller whose flair for embellishment tabloidizes his 'No Holds Barred' column and exposes him to endless lawsuits for defamation, it cannot be denied that his explosive revelations have had the cumulative effect of demolishing the hitherto invincible Barisan Nasional citadel, leaving the ruling party red-faced, bare-bottomed, private parts exposed to the world, and quaking uncontrollably in fear and anger. Yesterday RPK came out with yet another kick in the groin for deputy prime minister Najib Razak's dreams of succeeding Abdullah Badawi as Malaysia's next PM. Here's a juicy excerpt. Read the entire devastating revelation here. “Oh, that’s right.” Now I know whom this Datuk Syed Rahman is. He is that man always on TV beside Dr Shariibuu Setev, Altantuya’s father. I inched closer to Datuk Syed Abdul Rahman Alhabshi, now that I knew who he is. “No, I won’t mention your name,” I joked. “I’ll just say the Honorary Consul of Mongolia who wishes to remain anonymous.” There was laughter all around the table. Nevertheless he did talk, and talk a lot on top of that, after I assured him that nothing would be reported in Malaysia Today and that his name would not be mentioned. But that was before this. Now that he has gone on national TV and has acted very unprofessionally and unbecoming of a man of his status by ‘spilling his guts’ and lying on prime-time TV, then my ‘deal’ with him is now off. He has opened his mouth and has ‘testified’ on TV about what he knows about the Altantuya murder. I was prepared to keep his secret as long as he too keeps his secret, secret. But since he has now revealed all, then I too should not be bound by any ‘official secrets’ since these secrets are no longer secrets. “What? Rosmah?” I could not believe it. Datuk Syed Rahman smiled; pleased that at least for once someone could shock Raja Petra who never normally gets shocked by anything. Datuk Syed Rahman related in great detail what really happened. And what he related was a far departure from what transpired in the trial. Unfortunately, because commenting on an ongoing trial is considered sub judice and can attract a jail sentence, I am certainly not at liberty to also reveal in great detail what this Arab told me. And what he told me was very different from what he said on TV last night. Maybe one day, when the trial is over, I will be ‘free’ to talk about what Datuk Syed Rahman revealed in the Dome of the Bangsar Shopping Center that day, more than a year ago. But whether I will be ‘free’ in the real sense of the word or whether I will be speaking from behind the high walls of the Sungai Buloh or Kajang Prison is left to be seen. Maybe, after 16 September 2008, I will know. In the meantime stay tuned to learn more about what the Honorary Consul of Mongolia, Datuk Syed Abdul Rahman Alhabshi, revealed in 2007 in the Dome of the Bangsar Shopping Centre. The story is nothing short of what Hollywood movie scripts are made of. BUKIT MERTAJAM, Aug 23 (Bernama) -- Deputy Prime Minister Datuk Seri Najib Tun Razak on Friday night swore in Masjid Jamek Guar Perahu near here that he did not know or had any connection with Mongolian woman Altantuya Shaariibuu who was murdered in 2006 in Puncak Alam, Selangor. Najib said he was making the swearing although it was not an offical swearing made on the Quran. "Wallahi, Wabillahi, Watallahi (With Allah as my witness) I swear I do not know or have any connection with the Mongolian woman," he said at the end of his speech at a ceremony to give aid of RM1.4 million at the mosque. The aid is to repair, renovate and buy new equipment for eight mosques and 20 surau in the state constituency of Penanti. "I do not know if others want to swear or not but I know I did no wrong. This is between me and God," he said. Najib also made the same swearing by repeating the same words when he visited the Barisan Nasional (BN) operations room in Guar Perahu. Meawnhile, Mongolia's honorary consul in Malaysia, Datuk Syed Abdul Rahman Al-Habshi who was also present, said: "Datuk Seri Najib's swearing is true and it is accepted that he has no connection with Altantuya." Syed Abdul Rahman said when the murder happened he was the first Malaysian who knew of it and he was also the first to go to Mongolia to go over Altantuya's documents. "Not one document, photograph or video involved Najib," he said. Syed Abdul Rahman said Parti Keadilan Keadilan Rakyat (PKR) advisor Datuk Seri Anwar Ibrahim, Malaysia Today webmaster Raja Petra Kamaruddin and private investigator P Balasubramaniam had created a big lie. "I regret they feel they know more about the case. Anwar lied that he met Altantuya's father in Mongolia. At that time I knew Anwar was coming and took her father (Dr Shaariibuu Setev) to Russia," he said. "No one knows more than me and Anwar had lied with several accusations against Najib," Syed Abdul Rahman said. He said the reason he was present at the function was to clarify the confusion as Anwar's actions could affect the good relations between Malaysia and Mongolia and that he had been directed by Mongolia's Prime Minister Sanjaa Bayar to assist. 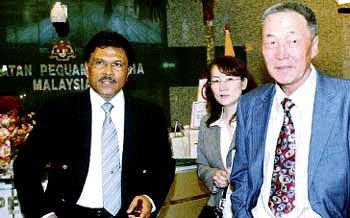 Syed Abdul Rahman said after he was appointed by the Mongolian prime minister to investigate the murder of Altantuya, he discovered that Najib had nothing to do with the case. He said he felt responsible to clarify the matter as if he kept quiet "the people will be more confused as more lies will be made and I feel ashamed that a national leader's name who has no connection with the case has been tarnished by Anwar and Raja Petra." "It is very shameful when our national leader's name is tarnished abroad as being involved in the case and that is why I have to clarify to the public about the lies that have been made," he said. Anwar at each rally in campaigning for the Permatang Pauh by-election has been alleging Najib had links to Altantuya. On July 3, at a news conference in Petaling Jaya chaired by Anwar, Balasubramaniam produced a statutory declaration that alleged Najib had sexual relations with Altantuya but the next day retracted it and subsequently went missing together with his family. 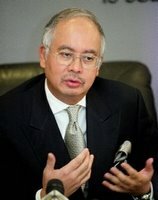 Raja Petra posted articles on his website alleging Najib was connected to her murder and he (Raja Petra) has since been charged in court for it. The Altantuya murder hearing is ongoing at the Shah Alam High Court. Najib also said Anwar's pledge to reduce fuel prices if he became prime minister was mere empty talk. "That is the way he conducts politics... making all kinds of claims. But today the BN government delivered on this," he said. Effective Saturday, the price of petrol (RON97) will be reduced by 15 sen to RM2.55 a litre from RM2.70, RON92 by 22 sen to RM2.40 a litre from RM2.62 and diesel by eight sen a litre to RM2.50 from RM2.58.